Unless you are rolling out more cash to buy yerba mate sin palo (free of stems), then you are probably consuming a blend commonly known as yerba mate elaborada con palo, which is sold with a percentage of stems in its composition. If on the one hand, many yerba mate experts agree that a small stem count actually contributes to the final taste and quality of the blend; on the other hand, larger stem counts result in lesser taste and lower quality. Technological advances, favorable climate and overall market growth, have led to an increase in yerba mate production in many regions of Brazil, Paraguay and Argentina; however quality hasn’t really been able to keep up with quantity, as the amount of stems per package has increased considerably in the last years. Yerba mate harvest is paid by the Kilo, so in this scenario weight is gold (or wood)! It seems like a contradiction, but it is not. Since early last century, yerba mate production has been littered with these vicious cycles: If there is a surplus in the harvest, then the quality improves; if there is a shortfall, the quality gets worst. South American producers have been planting yerba mate for hundreds of years, but still don’t seem to have learned their lesson. 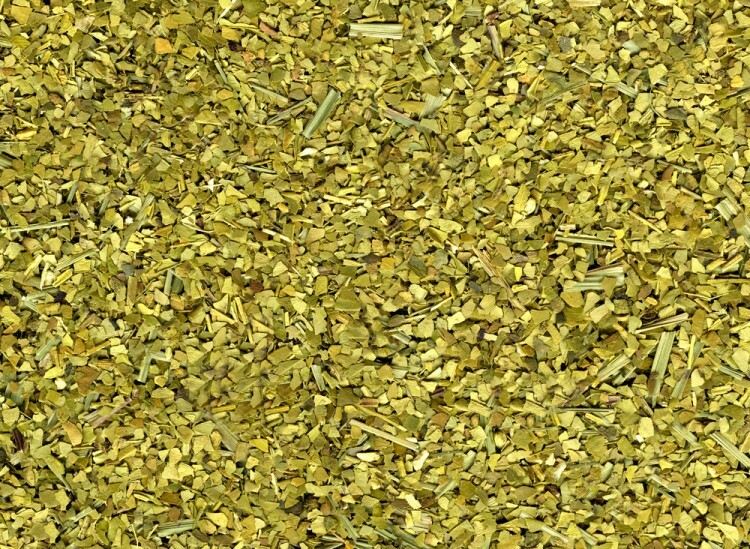 As an example, Argentina’s Código Alimentario (a national regulation for foods and beverages) determines that the total percentage of stems in yerba mate may not exceed 35% of the total amount of the product. In order to guarantee this, a sieve method is used to separate the total final product in two steps: The first step consists in filtering the yerba through a sieve of dimensions 1 x 20 mm, which then goes on to pass through a second filtering known as N° 40 sieve. The portion that “sticks” to the 1 x 20 mm sieve, is classified as stem and the portion the falls through the N° 40 sieve is classified as leaf. The problem with this method is that more often than not, sieve N° 40 also lets through other thin elements such as: coarse fibers, wooden peels and so on. Today it is not at all unusual to process stems up to 2 cm thick, although historically the industry has always worked with stems from 5 mm and no thicker than 7 mm. Given the high price of pure mate at the moment, it is not surprising that many producers use different methodologies and “hacks” to add more “stick” to their end product in order to get more volume – and of course, more money. Even if this means rolling out a lower quality product. Since 1999 Argentina has attempted to solve the problem by passing a new certification called Norma IRAM20511, which is much more effective in determining the real percentage of stems, but guess what? Yerba mate producers have continuously rejected it. So just how pure is your yerba mate really? I guess nobody knows and if they know, they are constantly turning the blind eye. What is clear is that the problem is not in the fields, but in the processing itself. Loopholes in the Norms allow such acts of dishonesty to go unpunished and the end result is visible at the least convenient place for an industry that needs to grow: inside the package purchased by consumers. Driven by continuous cases of disloyal competition, some producers have claimed for a new Norm, which analyses the amount of cellulose in the yerba as the main classifier of stem count. The main reason being that some competitors have been known to mix in finely cut stems to pass as leaves. Cellulose-based investigations done in the past, have shown that some yerbas present as much as 50% stem count. The result is a yerba that is much weaker and loses its taste much faster. As consumers we should all be aware of these practices in order to pressure the industry out of such acts of dishonesty. It is not just about getting more value (or taste) for our money, it is also about protecting a market with an immense potential for growth and a true symbol of South American culture. This is some interesting info. I never knew about the Argentine regulations and the challenges that they have faced. It will be interesting to know more about the nutritional composition of the palo. My first point, perhaps it is not necessarily a bad thing. I have heard that the theobromine is in the bark of the palo. I have tasted the raw bark of a little palito right of the tree and it’s very sweet. For me, I expect my yerba’s palos still to have the bark in tact. this means that the drying temperature used on the yerba was not too high. The bone-white palos are a result of extreme temperatures. My second point, in Brazil all the yerba is ground to a fine powder so its easy for the producer to “hide” surplus palos in the mix. It will be a lot of effort to make all transparent, maybe if there was an industrial use found for the palitos then the producer would be incentivised to sell palos as an independent product and not use in the yerba.The only true pure leaf mate is when you pluck each individual leaf off the branch and use them to make yerba, like the meta mate RAW, so most of the brands in Brazil marked, “pura folha” (pure leaf) are deceptive. Hey and thanks for your comment. Yes, you are right in both your observation about the palo and the Brazilian brands claiming to be “pure leaf”. I guess for the end-consumer there is no real way of knowing if fine powder yerba is indeed 100% yerba. I have tried Meta Mate Raw and its one of the best ones I have ever tasted.